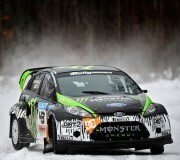 Browsing articles tagged with " Ford Fiesta"
Ken Block and Alex Gelsomino test the H.F.H.V. Ford Fiesta at Sayers Brook Bison Ranch in Missouri, gunning for a 6th consecutive win at the Rally in the 100 Acre Wood. Mercilessly kicking up dirt, leaves and unnamed debris, the Fiesta dazzles in the hands of Block, with calm navigation handled by Gelsomino. In this case, the video truly speaks for itself.